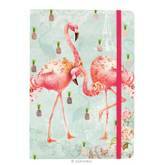 Record notes, ideas and thoughts on the go in this bright and quirky notebook! 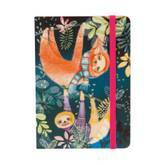 With an ocean blue background, the adorable Sloths feature on the front of this notebook in soft shades of tangerine and lemon, whilst the reverse displays vibrant multicoloured leaves surrounding the Santoro logo. The spine of the notebook is stylishly patterned, whilst the edges and elasticated closure are a bright shade of fuchsia. The interior contains lined pages for easier note making, each with a totally tropical illustration to detail. Sure to make your next writing experience a treat! 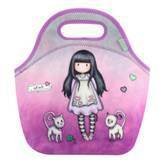 A cute and contemporary accessory case for storing make-up, cosmetics, stationery or crafts! 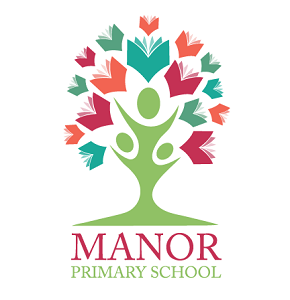 Featuring the vibrant Sloths artwork against an ocean blue background, the front of the case sees the brightly coloured creatures hanging from branches, whilst the reverse is decorated with a bold repeat pattern of leaves surrounding the Santoro logo. The case can be opened via the raspberry pink leatherette zip and has a padded floral interior lining. It is also splash-proof, and the compact size means it’s infinitely useful when travelling, or simply as a storage solution! Totally tropical! The case can be opened via the raspberry pink leatherette zip and has a padded floral interior lining. With a shimmering pearlescent base, it is splash-proof and oh-so stylish; use for school, work, as a holiday companion or simply as a storage solution! Carry your belongings in style in this beautiful satchel featuring the charismatic Dear Alice in vibrant tones of purple. Pull open the two golden buckle style press stud fastenings to find a clever compartment, lovingly lined with the iconic cream and black stripes find a clever compartment, lovingly lined with the iconic cream and black stripes. The perfect way to store your notes, doodles and inspirational ideas. Open the book to find chic cream sketching pages. Find the perfect little pouch on the inside of the front cover, where a nifty little stitched mini sketchpad can be found. At the back of the sketchbook you will find four handy pouches, ideal for storing your loose little bits and bobs. Each sketchbook contains 4 storage pockets and a pocket sketch book. With beautifully rich colour palettes and a polka dot patterned presentation board, this set includes 3 magnetic bookmarks in 2 different shapes. 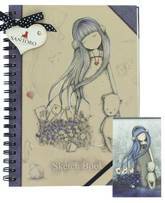 The captivating We Walk Together, adorable Time to Fly and heartfelt The Little Friend all feature, ensuring that pages are never lost again! Approx. 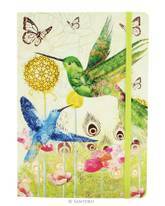 size: Long bookmark is 2.5cm wide and 7cm high and Round one is 4cm dia. Writing has never been so fun! 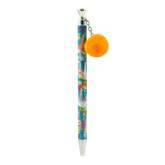 This delightful pen features the adorable Sloths artwork on a turquoise background, with a sweet tangerine orange pom pom to decorate the top! The vibrant colours, quirky design and super sweet dangler make this a must-have addition to any stationery lover’s collection! Oh-so tropical! Perfect for cosying up with your favourite book, this Gorjuss Chronicles bookmark is the most adorable way to save your page! 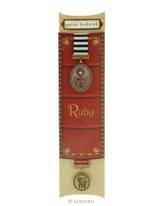 Beautifully packaged to sit upon the spine of a classically detailed book, this bookmark is striped with a metal embellishment to decorate each end. One side features the endearing Ruby artwork in a rich red colour palette, and the other is detailed with the adorable Ruby cat design. 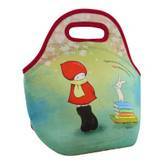 Functional but simply Gorjuss, it is ideal for any book lover! A must-have accessory for any avid book reader! 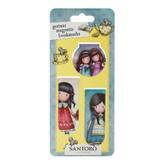 A charming selection of Gorjuss magnetic bookmarks! A must-have accessory for avid readers and book lovers, it makes the perfect gift for loved ones to cherish! This delightful pen features the adorable Toucans artwork on a fuchsia background, with a sweet tangerine orange pom pom to decorate the top! 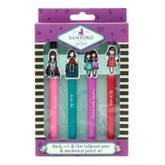 Scribble, doodle, write and draw in 4 different colours! Detailed with horizontal sky blue lines all the way round, the minimal Stay Pawsitive artwork features on this sophisticated multipen. 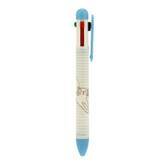 Choose to write in black, blue, red or green, and with a handy clip you can take your feline friend anywhere. 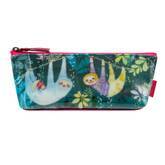 A must-have writing accessory for any stylish pencil case. A stationery lover’s dream! 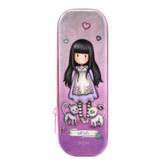 This contemporary clipboard with pad is just purrrfect for organising, doodling and writing stories on the go. 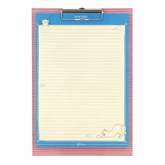 The clipboard is rose pink with minimal cream lines running horizontally across both sides, and two mischievous cats playing on the reverse. 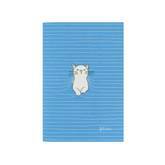 Secured with a metal clasp, the notepad is A4 in size with a stylish sky blue border, and features two other cats catching mice and peering over the top. The paper is lined for easier note-making and pages can be torn from the top after use. 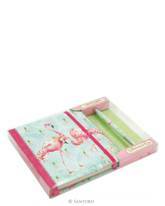 A must-have addition to any sophisticated stationery collection! The captivating The Scarf, enchanting The Dark Streak and adorable The Foxes all feature, ensuring that pages are never lost again! 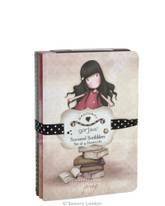 The loveable Oops a Daisy, adorable Rosebud and enchanting Pom Pom all feature, ensuring that pages are never lost again! 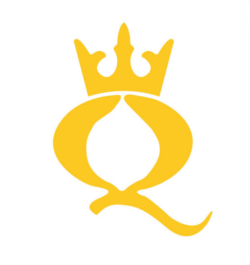 Keep hydrated in style with this fun and functional water bottle! 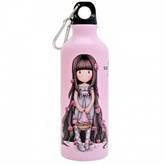 Featuring the adorable Rosie artwork in blush pink and pastel blue tones, the bottle has a black screw top to close. 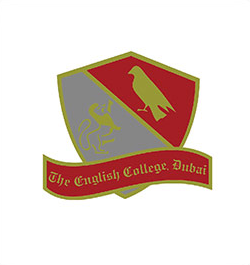 Attach to a bag or belt with the handy karabiner clip, making it the ideal accessory for school, college or work. 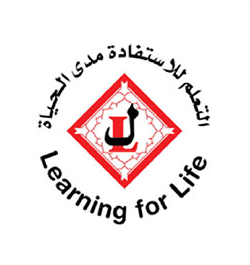 Not suitable for use with dairy / baby products, alcoholic, carbonated or hot liquids. This Gorjuss writing set is perfect for all of your scribbling, doodling and note-making needs! 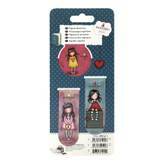 Included in the box are 1 black, 1 red and 1 blue pen as well as a mechanical pencil, each decorated with a different Gorjuss artwork. The adorable designs featured are the oh-so sweet Rosebud, captivating My Story, heartfelt Friends Walk Together and beloved Time to Fly. Neatly packaged in a patterned purple box with iconic monochrome stripes, this is both a pretty and practical addition to your stationery collection! A unique storage solution for stationery, crafts, trinkets and trifles! Sweetly detailed with the captivating Tall Tails artwork in a pastel colour palette of mauve, lilac and stone grey, the tin can be opened with the pink zip to reveal a polka dot printed interior and ample space. Perfect for stowing stationery and accessories, it is a must-have addition to any Gorjuss workspace! 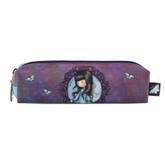 Travel in style with this Gorjuss accessory case! Spaciously designed and featuring the adorable Bubble Fairy artwork, this splash-proof case is a must-have for stowing cosmetics, make-up, stationery and everything in-between! Detailed with delicate printed butterflies and stars, the case is finished in royal purple and steel blue tones, with iconic stripes on the base and reverse. Open the sweet antique brass effect zip embellishment to reveal a polka dot interior lining and ample space. Ideal as a holiday companion, gym buddy or handbag tidy, it is simply too cute to resist! Spaciously designed and featuring the captivating Tall Tails artwork, this splash-proof case is a must-have for stowing cosmetics, make-up, stationery and everything in-between! Detailed with delicate printed hearts, the case is finished in candy pink, lilac and mint tones, with iconic stripes on the base and reverse. Open the sweet antique brass effect zip embellishment to reveal a polka dot interior lining and ample space. 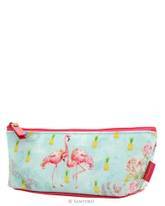 Ideal as a holiday companion, gym buddy or handbag tidy, it is simply too cute to resist! Featuring the oh-so sweet The Librarian artwork, this adorable lunch bag has delicate floral prints to detail and a rich colour palette of teal, ruby and grass green. 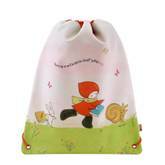 Beautifully crafted from durable, wipe clean neoprene, it can be carried with the comfortable red handles and has a zip fastening to close. With ample interior space for yummy snacks and treats, it is the dreamiest way to dine on the go. A must-have for school or college! 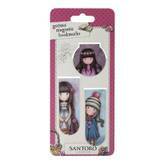 A stationery necessity for school or work! This Gorjuss highlighter set has a flexible, waterproof casing with iconic monochrome stripes to detail, and 4 mini highlighters inside. The oh-so sweet Sugar and Spice, captivating The Scarf, endearing You Brought Me Love and heartfelt Ruby feature, in pink, yellow, green and blue. 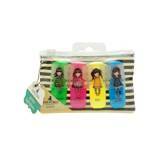 Fun and functional, they are perfect for adding a splash of colour to notes! 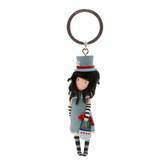 A delightful addition to any bag or set of keys! 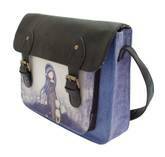 Moulded in the shape of the captivating The Hatter artwork, it is the perfect accessory to add a touch of Gorjuss style! Make writing the purrrfect treat with this contemporary stitched notebook. The ideal place to scribble down thoughts and creative ideas, it features the stylish Purrrfect Place artwork on the front. With a simple sky blue background, the pad has minimal cream horizontal lines detailing each side, with our feline friend peering through them. The interior has a section of lined pages with a sophisticated cat playing at the bottom, as well as a section of pastel blue plain pages with yarn balls decorating the edges. Cool and collected, it is a must-have writing accessory for any cat enthusiast.